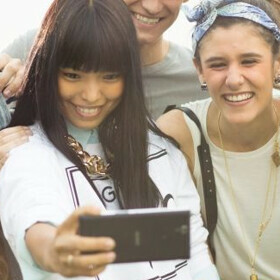 Sony is seemingly getting ready to introduce a new selfie phone that's called Xperia Cosmos. Photos of the Cosmos have appeared on Twitter today, showing a device with a large front-facing camera that's paired with an LED flash. The Cosmos could be the successor to last year's Xperia C3, which is Sony's first (and only) smartphone to have a 5 MP front-facing camera with LED flash. According to @upleaks, the Xperia Cosmos runs Android 5.0 Lollipop, and is powered by an unknown MediaTek processor. This would be Sony's third smartphone of 2015 to use a MediaTek solution, after the affordable Xperia E4 and E4g (both of which will be available in the near future). The Xperia C3 (seen above) has a 5.5-inch 720p display, but it's not clear if the Cosmos sports a similarly sized display (or if it's a mid-range device, like the C3). Hopefully, it won't be long until we find out more about this new Sony Xperia. Correct me if I'm wrong but I thought the Walkman app was being retired in Lollipop and being replaced with just 'Music'. If it comes with a MT6752 at least at under $250, I'll forgive the huge top bezel with the gigantic camera ring. Is it common to place a comma anywhere you please in Bulgaria? Just asking. It appears that this website has no editorial control over its writers. They seem to believe that a comma is the same thing as a space. Uh? They did already. All Sony icons are now accords to Material Design principles even for 4.4 headsets.